How to Use Coupons | Tons of Great Tips & Tricks to Get You Started! If one of your Frugal New Year Resolutions is to start using coupons, to get better at using coupons, or to organize your coupons, I thought it might be helpful to put links to all of my online articles/tutorials about Couponing in one place! 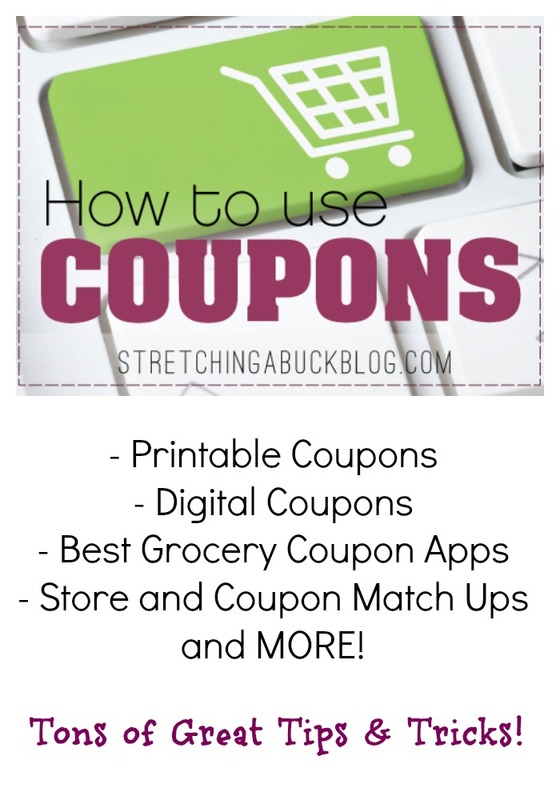 Whether you are a seasoned coupon user or just getting started, check out the info listed below to learn more about everything from the coupon inserts in your Sunday paper to my favorite grocery and coupon saving apps! Note: Giant Eagle is posted on Wednesdays. All other stores are posted on Saturday and Sunday each week. All of the store deals listed on this site are based on Central Ohio sales ads. Be sure to check your local ads for coupon policy info and deals specific to your area. These are reputable sites that I use myself. Most printable coupons site allow you to print each coupon twice per computer. This may vary. If you prefer to clip coupons electronically, here are some great sits to get you started. In most cases, digital coupons cannot be combined with paper coupons. Grocery and Coupon apps are growing in popularity. Here are two of my favorites. If you are new to couponing (or not! ), what questions do you have for me? Please let me know in the comments below and I’ll do my best to help!